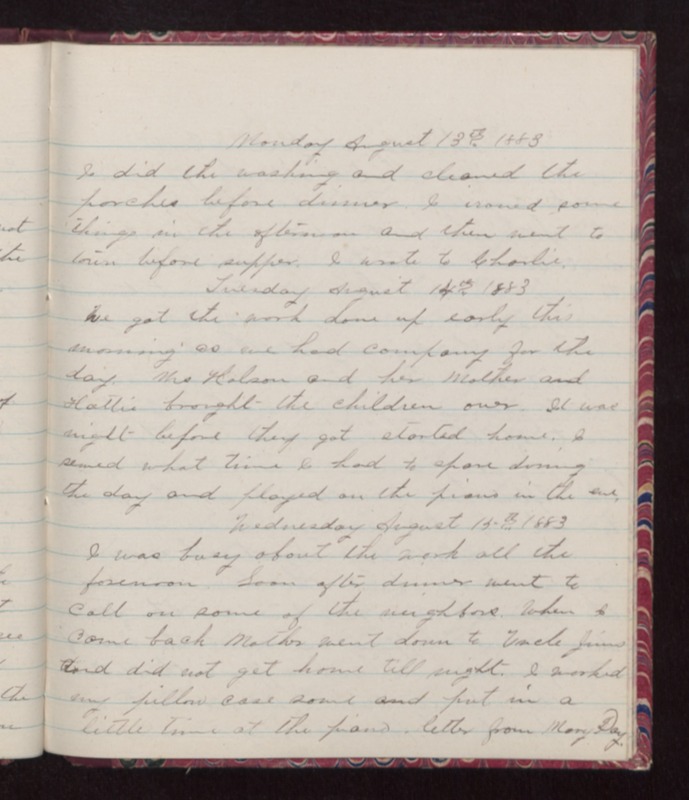 Monday August 13th 1883 I did the washing and cleaned the porches before dinner. I ironed some things in the afternoon and then went to town before supper. I wrote to Charlie. Tuesday August 14th 1883 We got the work done up early this morning as we had company for the day. Mrs Holsom and her Mother and Hattie brought the children over. It was night before they got started home. I sewed what time I had to spare during the day and played on the piano in the eve. Wednesday August 15th 1883 I was busy about the work all the forenoon. Soon after dinner went to call on some of the neighbors. When I came back Mother went down to Uncle Jims and did not get home till night. I worked my pillow case some and put in a little time at the piano. letter from Mary Day.